The Data.Space 2019 conference ended on Friday, and it was great to get to meet, listen to and talk with some of the players in the burgeoning UK Space sector. The two day event covered a lot of ground and there are a few takeaways that I feel are worth sharing. Fortunately my talk came on the second day of the conference, so I did have an opportunity to address these three points from both buy side and sell side perspectives. 1. There still seems to be a disconnect between solution providers and clients, and this is concerning. 2. Technology development and adaptation to address #1 continues to level the playing field for market entrants. Barriers to entry are lower for small companies to compete. 3. The investment climate should be monitored. Recent startup success in the space sector (Planet being the most visible) has served as a great catalyst for shifting the perception of those following the space sector from expensive science experiment to viable commercial business. However, there is still work to do, particularly on the side of the solution providers. 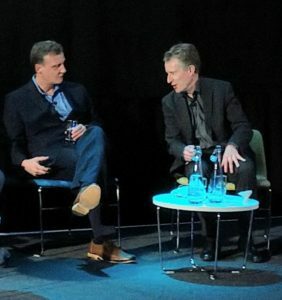 Having the dual vantage point as both a provider (sell-side) and consumer (buy-side) in the alternative data space, I believe that data-driven space startups still need to make a clear and tighter business case for their services, which are now fashionably marketed under the ‘as-a-service’ moniker: Space Data as a Service. Yes we are seeing an increase in launches, with more platforms collecting more data, and that data is being transformed into more services, supporting more industries, etc. But the customer still needs to see a clear path to revenue, and in many cases that message is not still being translated effectively. This problem is not unique to the NewSpace sector – it is actually a broader Data as a Service problem. In financial services, the rise of the ‘quantamental investor’ has spurred demand for all sorts of non-traditional data, which machine learning and data scientists then exploit to try to generate a market advantage. This alternative data ranges from credit card transactions and geolocation data, to weather and satellite data. But generating insights from this data is usually much more challenging than it sounds. The sell side are the experts in the data itself (how it is collected, what it represents, domain-specific nuances associated, etc) and this knowledge is oftentimes difficult to translate to potential clients. Further, they are not always well versed enough in how a FinServ/FinTech client may want to use the data. On the buy side, users want to utilize the data towards identifying trade opportunities, but they usually are not well versed in the intricacies and nuances associated with the data they are ingesting. This disconnect can lead to confusion, false expectations, and frustrations on both sides. One way to avoid this confusion is to build teams that have some real expertise from the other side of the table. If you are a satellite data provider selling to Financial Services, get a former trader on your staff. People looking into the financial services sector from the outside, with no direct experience, usually have a very different idea of how the buy side operates, what they do with data post acquisition, and most importantly how to monetize. On the investment side, I would have liked to hear a little more from the VC/PE community. 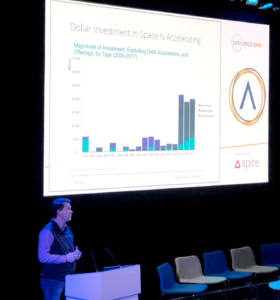 We all know that NewSpace is generating buzz amongst VC investors, and sector deals have jumped dramatically since 2015 (even without the Planet raises). But there was one slide which really stuck out from Gareth Keane’s (of Promus Ventures) talk. As Dr. Keane was discussing investment in the sector since 2000, I couldn’t help but to think of the cleantech boom (and subsequent bust) from about a decade ago. In 2008, the market was generally rangebound, then saw a huge inflow of capital from just about everyone, the market got frothy, and this was followed by a bust. Today, CleanTech is growing in a much more sustainable manner, but there were some very expensive lessons in 2008. Some of the same factors are in play today: similar macroeconomic factors, impatient investors, longer timelines, and market uncertainty. Certain driving forces are beyond our control. But we should look to the 2008 cycle to avoid some of the behaviors that contributed to the market withdrawal. Prudent investing, including proper diligence, technical understanding, and can help the NewSpace sector avoid some of the traps that led to the CleanTech exodus. This is the last post from Data.Space2019; my first two posts can be found here and here. While there are challenges ahead, the NewSpace community is talented, committed, and possibly most importantly, global. I am absolutely optimistic on the potential of NewSpace, globally, in 2019, and I look forward to Data.Space2020. If you are interested in receiving the slides from my presentation, please follow this link, or contact me at michael@atlasresearchinnovations.com.